We started with Blueberry and Cream Cheese Pancake Tower (Php 450). This is six buttermilk pancakes with layers of preserved blueberries and thick cream cheese, topped with blueberry compote. I have to admit that it takes a lot for me to get impressed with pancakes, but hands down to this one. We emptied the dish within seconds. We also had Huevos Rancheros (Php 340). For pasta, we ordered the Spaetzle Jambalaya (Php 390). A little on the spicy side, this dish has fresh spaetzle with special Jambalaya sauce, generously topped with mussels and shrimps. If you want some seafood dish with a kick, then this dish is for you. What will really make me return to Maple is the Prime Rib Tapa (Php 520). We had it on medium rare. 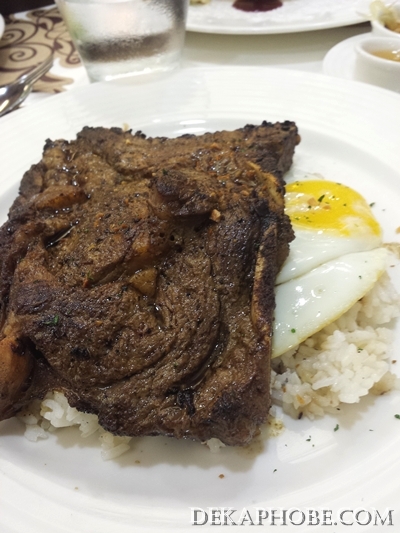 This marinated prime rib is served with garlic rice, two eggs, tomato-onion salsa, atchara and vinegar sauce. If this prime rib tapa were a guy, I'll marry it right away. It was tenderness through and through. It was good on its own I completely forgot the salsa and the vinegar. 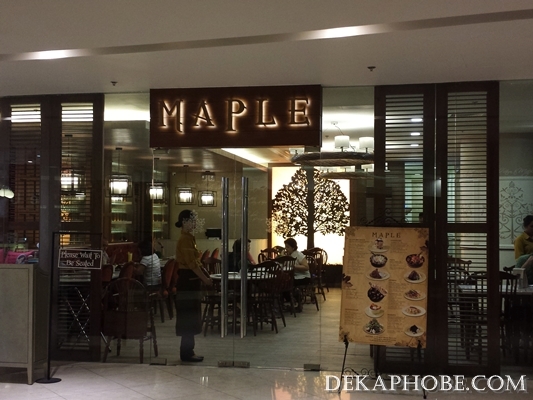 Maple may be a little on high side, but the food and the service are worth it. I was really impressed with the dishes we had that I see myself returning to try the other dishes they have to offer. Yes, along with the damn Prime Rib Tapa. The tapa... :D If it was a girl I would court her till she says yes:D hehehe :D Love it! I just dined at pancake house last week with my parents and sis and I didn't like their meals much. The pancakes were great though. We tried the blueberry one. I wonder if they're similar to Maple's blueberry and cream cheese tower. i so love tapa! wanna try this sometime! More or less Php 500. :) Tara!!! I want to try out Maple too! I think its a nice touch that they glaze their dinner roll with maple syrup :) -- Huevos Rancheros is on my list. I wanna try the prime rib tapa ah! Fave ko tapa eh. The pictures make me drool! I want to try the Rancheros and Jambalaya!